In the last week I’ve had two people compliment the quality and appearance of my skin and desperately asked me what my secret was. They were frustrated at how dry and flaky their skin was and wanted it to look like mine. This isn’t the first time people have noticed my skin, but it finally hit me that maybe I could share it in a blog and reach more people with my advice. Most people think it’s counterintuitive to directly apply oil to your face, but a healthy oil is meant to balance your skin’s sebum (natural oil). I never feel too oily unless I’ve applied more than I actually needed. It takes time in the beginning to gauge the right amount you need for you face. Having had a history of bad skin during my adolescence, coupled with my yearning and perseverance to fix it, I started asking Makeup Artist friends what they used to keep their skin healthy. These guys and gals deal with skin on a daily basis so who better to ask than them! That’s when I discovered the simple routine to getting great looking hydrated skin. Here’s the starter kit I would recommend as this is what I currently use on the daily. I personally think it’s a great place to start on your road to hydrated skin. Here’s the list! I’ve also provided quick links to the exact items on amazon for your convenience! After I’ve cleansed my face I gently pat it dry and place a couple drops of JOJOBA oil in the palm of my hand. Then, with the tips of my fingers, I gently apply the oil in upward motions making sure I get my cheeks, forehead, chin, nose, and outer areas of the face. Jojoba oil can be used as a moisture rich treatment for dry and cracked skin, as well as wrinkles. You can also use it daily for an all around natural glow. This is why I use it as the foundation of my moisturizing routine! 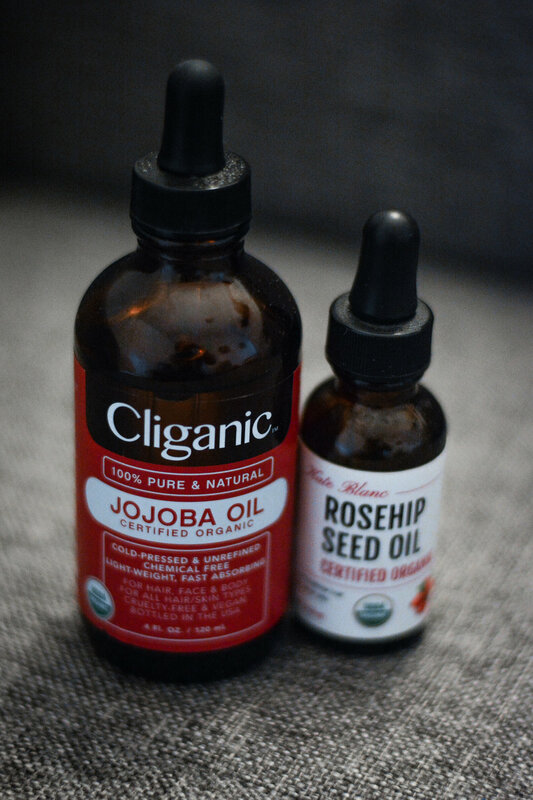 Then, I’ll apply about 2-4 drops of Rosehip Seed oil and apply that to my under eyes and temples where I have slight acne scarring and forehead/brow lines. I always use my ring finger to apply anything to my under-eyes because I’ve been told it’s gentler on more delicate areas of the face. The reason I use Rosehip Seed oil on smaller areas on the face that have experienced slight damage or wear is cause this oil is rich in essential fatty acids and antioxidents, which are vital for tissue and cell regeneration in the skin. It’s been recognized for its wound healing properties and ability to reduce scared and fine lines. After I've applied my oils I usually finish my routine with a setting spray I make which consists of 50% witch hazel and 50% rosewater. Witch hazel acts as an astringent to help remove bacteria from your skin’s surface, shrink your pores, soothe your skin and reduce inflammation. Rosewater behaves in much of the same way. Most people use this combination and apply it to a cotton pad to use as a toner which I sometimes do as well, but I like the finishing touch of using these as a setting spray application. My skin will still absorb all the wonderful qualities witch hazel and rosewater have to offer. Before you go and buy any of these oil products make absolutely sure their label contains verbiage like 100% Pure Organic, USDA Organic, cold-pressed and unrefined. This ensures the healing properties have not been destroyed by a process that uses heat to extract the oil. Witch hazel can be found in many places (I bought mine at cvs) and a good rosewater I’d recommend can be found at Trader Joes. If you do end up using these products be sure to SHARE YOUR EXPERIENCE with me in the comment section below! I love hearing feedback from those I’ve had the opportunity to inspire and influence. Apr 17 Urban Outfitters Inspired Room Makeover!